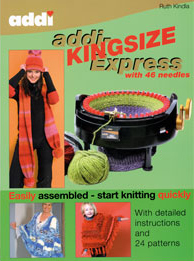 Book of patterns, ideas and techniques to use with the larger ADDI Express Kingsize knitting machine. Detailed instructions and 24 patterns. Speedy knits for all the family: including jumpers, waistcoats, jackets, bags, hats and scarves and a romper suit!